I can’t really begin to emphasise how inexperienced and inept I am at working sheep with my dogs. We basically have sheep that aren’t used to, and don’t want to be worked by dogs. Daisy Dog has limited experience and came late to working sheep, and Kainaat is 10 months old and loses his head when he sees sheep. Add to this the fact that I am a novice and total numpty when it comes to working sheep and we have a situation. We get around this and manage to move sheep, corall them for health checks and capture escapees by using Daisy and the magic bucket of power. Today though we used team work instead of the bucket of power! Last night James was messing with the hurdles that divide up our fields and accidentally let one of the stubborn Suffolks into the next field. As I walked past on our morning walk I thought it would be a good idea to move the sheep back with its friends – it was at the far end of the field by the road. I didn’t have the bucket of power or the crook of calm so just sent Daisy in. Daisy is a good girl – she understands basic commands (away, comebye, walk-up etc) and I can move her round the field and the sheep , but she lacks the power to move stubborn sheep. This was maybe caused by starting sheep work quite late, or by the fact that I first worked her on the evil Indian runner drakes. Both our dogs are taught not to attack poultry – this is a fundamental rule of the smallholding. While the drakes started off quite compliant and Daisy could move them around our front garden, they gradually became more and more evil, and realising that she would not retaliate they would push her into a corner and peck at her – not good for her self confidence. Anyway we got our own back, when we got the sheep last July we killed and ate the ducks. As they were old and tough I made confit with them which I then used in cassoulet – delicious. 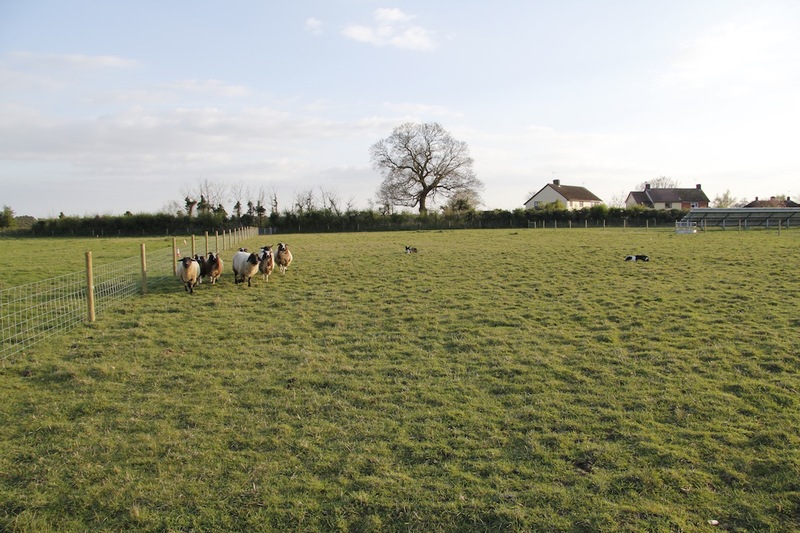 Anyway, Daisy ran up behind the sheep, but the Suffolk just ignored her – what to do? Then I thought about my secret weapon. While we joke that Kai’s dog name is Barky-barkalot the poo-eater I suspect he thinks his name is Kai the fleet and fearless. When it comes to sheep he really is fearless and is quite prepared to go head to head with a Suffolk and to give them a little nip to encourage movement. However, he is 10 months old and while he is quick to learn in non-sheep situations, he loses his head with the sheep. When I do let him play with them we concentrate on a basic recall and down command out in the field and on direction when they are in a corall. However, he doesn’t know how to hold sheep nor does he actually listen to any direction commands that I give. 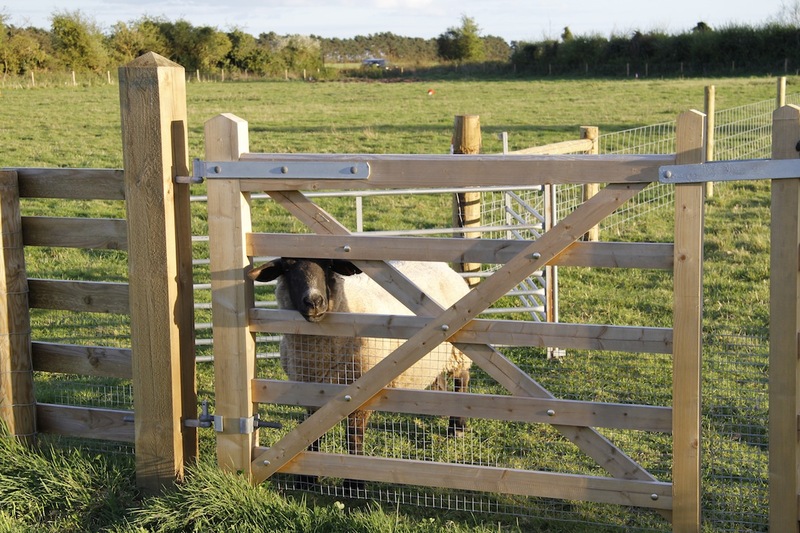 So, I opened the gate and Kainaat shot off like a rocket right up to the sheep which instantly moved as they have learnt not to mess with him. But, there was no control on where the sheep was moving. 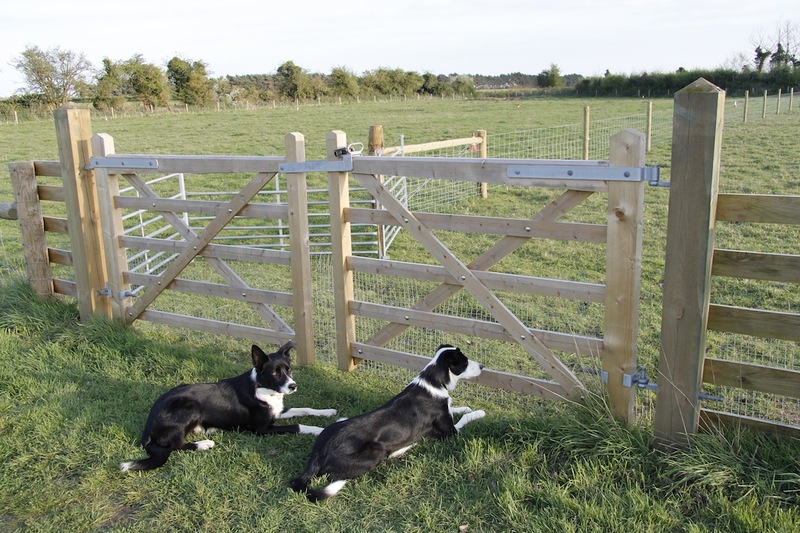 So I called both the dogs back to me and then sent Daisy Dog away – she ran anti-clockwise round the field and behind the sheep and Kai followed her. 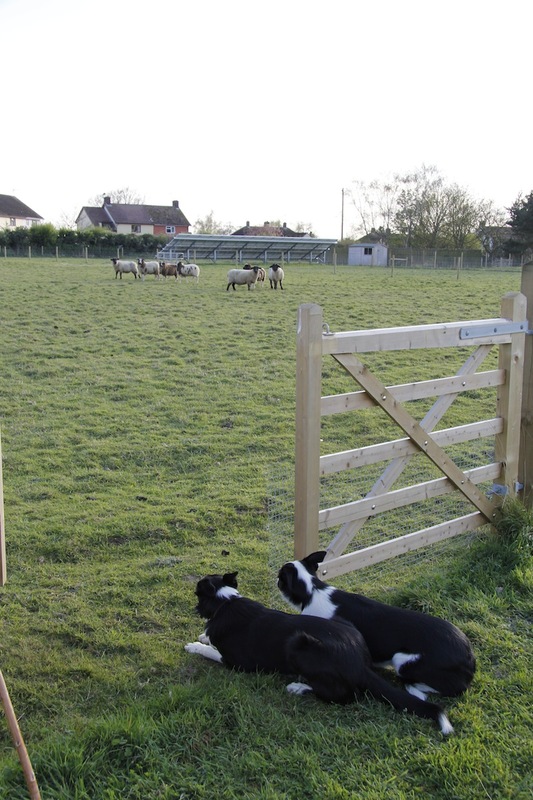 With Daisy providing the position and Kai the force to move the sheep, as a team we managed to encourage the Suffolk down the fence line and through a small gap in the hurdles. Our first attempt at brace (two dogs working together) work and Kainaat’s first real job with the sheep. N.B. Of course I took these photos later as I didn’t have my camera before. Both dogs were being surprisingly well behaved, attentive and working well together again. If you look closely you can see them both doing very nice ‘downs’. I know what you mean about feeling like a novice and having an inexperienced dog. Years ago we had a herding dog, and took him to a class where he was supposed to learn how to herd sheep. (We didn’t own any sheep, we just thought he might enjoy herding). But he didn’t seem to enjoy the class, and we didn’t continue with it. When I first took Daisy to a friend’s sheep she was probably about one-ish and she initially didn’t know what to do and then ended up getting chased by the sheep. 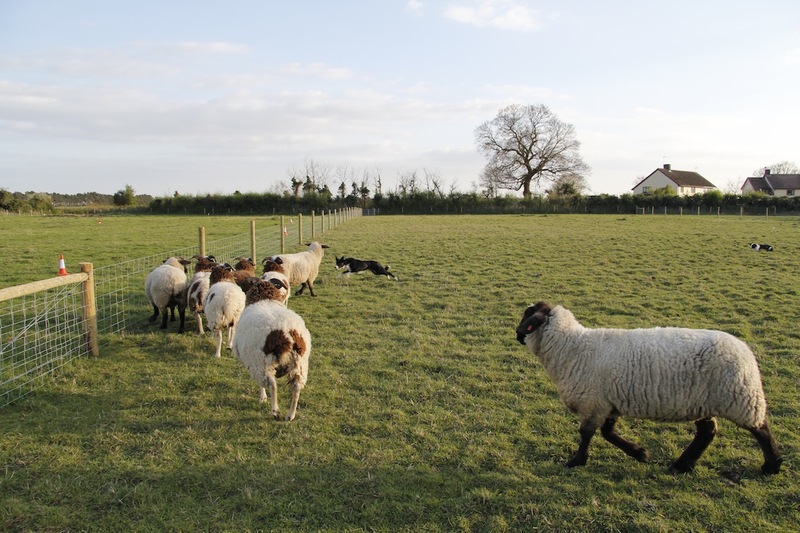 A bit later she realised the point and then went mad – one sheep leapt over the hedge, another hid in the pig sty and a few others crowded behind trees and bushes – they were all fine. I despaired, but quite quickly I managed to get some control over her and it became fun. His sheep were used to being worked by dogs though – this makes all the difference – I wish I had sheep like that. Oh well, we will persevere. I also work my dogs in working dog trials and we try and train at home a little every day (although recently it has a lot less) and I go to a class once a week. People often ask me why my dog isn’t trained yet – why I still need classes. To most people she seems very well trained, but in the working trials world we are still very much novices. Our dog never got past the “being chased by the sheep stage”. . . It’s a little different, but I totally agree about the classes. I took our dog to obedience classes for several years. He loved them (and I guess that I did, too)–and it made such a difference in his behavior.